Both we and the Elves are big fans of the Unimog, here at TLCB Towers. We’ve blogged various shapes and sizes of Mercedes’ classic 4×4 utility vehicle over the years. Small, Technic, official and cute have all featured here, to name but a few. We also all know that orange Smarties are the best. You can therefore imagine the excitement throughout the executive editorial penthouse when a hoard of frantic Elves rolled in with their latest discovery. There were celebrations! There was joy! There was pandemonium! There was chaos! There was the first ever deployment of our Judge Dredd style riot foam. Happily this meant that we got to eat all of the orange Smarties whilst we freed our immobilised workforce. Click this link to Flickr to see more of this, and other excellent vehicles in the series, on Gene 3S’s Photostream. The Elves love finding models of Mercedes-Benz’s ubiquitous Unimog. Firstly, the models are usually packed with working features. Damian Z.’s has a very nice Hiab crane mounted behind its cab. Secondly, the models are often built in orange, meaning that the lucky finder is rewarded with an orange Smartie, which are the best sort. Click on this link to Damian’s album on Flickr to see more details, including the neatly attached air intake pipe. There’s nothing more smug than a Smart parked end-on to the curb. And rightly so. Cars are friggin’ massive these days as designers have made each successive model bigger in order to increase interior space. Which is, frankly, a really lazy way to do it. Mercedes and Swatch thought a little differently, and their 1998 Smart ForTwo was a triumph of clever packaging not seen since the original 1959 Mini. 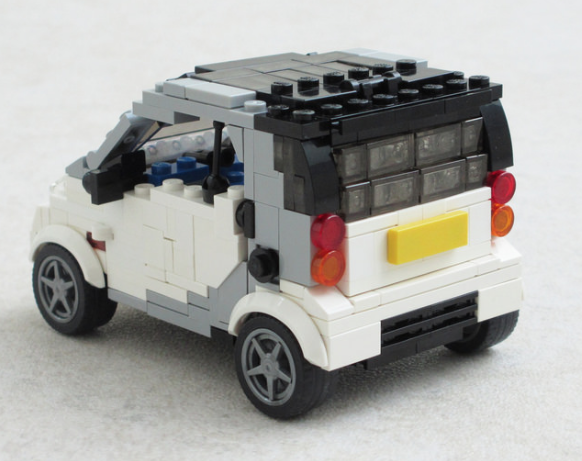 Ralph Saveslberg‘s Lego recreation of the iconic European city car is similarly clever, with bricks placed sideways, backwards and upside-down in order to replicate the Smart’s famous shape and visible tridion safety cell. 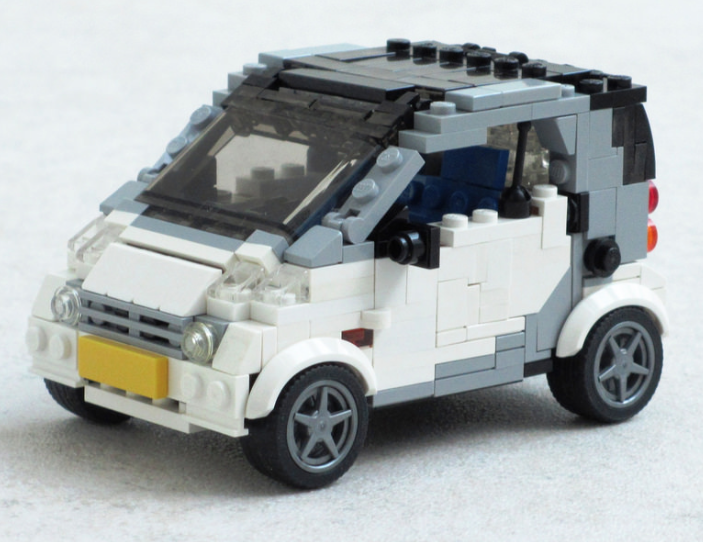 Ralph’s ForTwo is available to view on Flickr – click the above for a little more. It might be the middle of summer here at the TLCB Towers (causing us many hot pant/mini skirt related distractions whilst driving), but our worldwide readership means that many of you will be reading this with your heating cranked up and a jumper on. If you’re one of our winter-bound readers then today’s post is just for you! It’s the work of Brickshelf’s stefanbetulapendula, and he’s done a superb job fitting LEGO’s own 8110 Unimog set with all the equipment needed for a snowstorm. Up front is a fantastically intricate looking snow blower, whilst a grit/salt hopper and dispenser has been mounted on the Unimog’s load-bed. Stefan has also retro-fitted Power Functions receivers and motors, making his Unimog fully remote-controlled too. 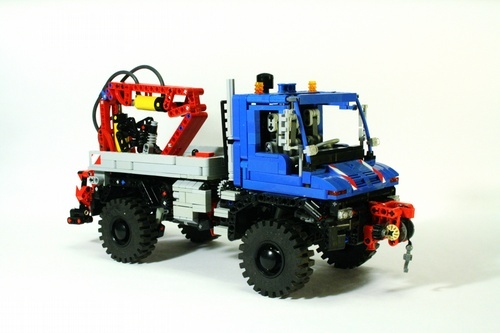 You can check out all the modifications via the complete gallery on Brickshelf by clicking the link above, and you can read TLCB’s expert review of the original LEGO Technic 8110 Unimog set by clicking here. The 1950s Mercedes-Benz 300 SL is, according to TLCB anyway, one of the most beautiful cars ever made. Part of its legendary appeal is down to the incredible ‘gull wing’ doors that debuted on the car. Beautiful as those doors were though they did have a drawback. The 300 SL was based on the boring old bits from normal Mercedes saloon cars that really weren’t up to the job of handling the power from its inline-6 engine, an engine that was the first to feature direct injection and made over 200bhp (a lot for the 1950s). As such SLs were quite… crash-able, and if you were trapped inside one upside-down all thoughts about how funky the doors were would vanish when you realised they couldn’t be opened. 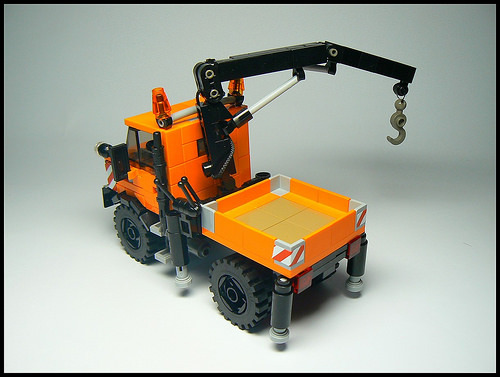 One of the nicest Town creations we’ve seen in ages, nolnet‘s rail-adapted Mercedes Unimog is reminiscent of Lego’s own 4546 set from way back in 1991, at the dawn of the 9V train era. Check it out on Flickr. Not a Unimog. Just as cool. It’s Technic time; and what a vehicle to build from LEGO’s little beams and axles. This is a Mercedes G-Wagon, and alongside the Unimog it’s probably the toughest vehicle on the planet. Well, unless you drop the suspension and put 22 inch rims on it, but no-one reading this is that sort of person are they? Efferman has kept his G-Wagon the way it should be; ready for some serious off-roading. And although this version is made from little bits of plastic, it’s more than capable in the rough stuff. To see how, make a visit Efferman’s Flickr page. nolnet on Flickr revisits the early ’80s with his Unimoged version of the classic Town set 6653. We think his rebooted version is much cooler than the original! See more of nolnet’s work by clicking the link above. You know the one, first made in Lego Technic in 1981 and 1,000 times since. 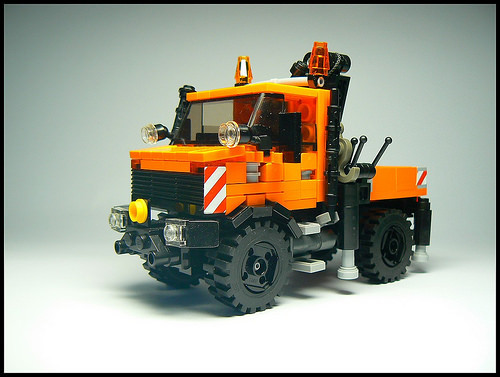 Still, this Unimog, by Dikkie Klijn of MOCpages, is well worth a look. It has more and better features than the 8110 set and it’s half the size. Elf size, in fact, which might be why they like it so much. Ralph Savelsberg aka Mad Physicist on Flickr raises a question over the validity of our blog title with his suspiciously empty but rather brilliant Mercedes Actros car transporter. See the full gallery at Ralph’s Flickr photstream. That’s better, cars everywhere! Points for those who can identify all eight. This incredible chrome and red beast looks Christmassy enough to get posted on The Lego Car Blog this month. Ah, who are we kidding, it could have been pink and we’d still have featured it! The Elves uncovered this astonishingly beautiful Mercedes-Benz 540K Special on MOCpages. Built by the infamous Sariel, it’s fully remote control underneath that gorgeous bodywork and even has working lights. Check out the full gallery and video complete with cheesy lift-music by clicking the link above. Henning Birkeland has built this wonderful 8-wide Mercedes Simplex produced between 1902 and 1909 by Daimler. Look at all those angles and offsets, and the marvelous colour design! It’s got everything a car needs – four wheels (plus a spare tire), a drop-top, and a crank. What has been improved since those days? I really don’t know … Oh yes, we have airbags. Show your appreciation on MOCpages.